Confederate Soldier in Texas: Lt. Harry T. Buford and Loreta Janeta Velázquez. Lt. Harry T. Buford may not have been born a Texan but, after serving in the Confederate Army during the Civil War, when it came time to pen memoirs, Texas was the place chosen to do it. Feisty and good looking, Buford saw bloody action in combat at Manassas (Bull Run) and Shiloh, among other famous Civil War battles and was wounded at Bull Run. “No medical care is necessary,” said Buford, remounting the steed and returning to camp, letting nature heal the wound. It was worse at Shiloh, when shrapnel tore the foot and leg. Again, “No medical care!” This time though, when the pain could no longer be tolerated, Buford agreed to permit medical attention. Upon examination, the astonished medic found that Lt. Harry T. Buford was not an ordinary case, not by a long shot. Harry T. Buford was not even a man. He was a woman. What daddy would have hated most was that she would write it in Texas. Loreta’s childhood was spent "haunted with the idea of being a man." Her idol and the inspiration for her future flirtations with manly danger, was Joan of Arc, and she practiced shooting, dueling, and hard riding, then exclusive to the world of men. When rebellious Loreta turned 14, she married a U.S. Army officer known only as “William,” and was promptly disowned by her parents. 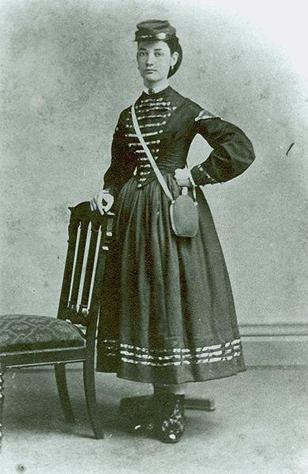 She soon convinced her young husband to resign his commission in the U.S. Army and join the Confederate Army instead. For herself, Loreta had a special uniform made by a tailor in Memphis, designed to conceal her womanly physique and, with padding, suggest masculine physical characteristics. She applied a false mustache and Van Dyke beard to complete the picture. Hello Lt. Buford! In her autobiography, she claims to have raised her own Confederate battalion in Arkansas, though that statement was later vehemently disputed by one Jubal Early, who cited several inaccuracies, while refusing to credit her many accuracies. To this day, some scholars refute Velázquez's memoirs as more hoax than history, but there are enough facts in her story to refute the refutations. According to historynet.com, she claimed to have "enrolled 236 men in four days and shipped them to Pensacola, Florida, where she presented them to her astonished husband as his to command. Unfortunately, he was killed a few days later demonstrating a weapon to his troops. The bereaved widow turned the men over to a friend and proceeded to search for military adventure at the front." Some time after Bull Run, she reverted to appearing as female. Dressed in women's clothes borrowed from a Tennessee farmer's wife, she traveled to Washington D.C. as a spy, and gathered intelligence for the South. She claims to have met President Lincoln, as well as Secretary of War Cameron. When bored with being in women's attire, she would again take up arms for the Confederacy as Lt. Buford. She later attempted to legitimize her behavior by establishing a (questionable) past connection to the political and artistic famous (Don Diego Velázquez, Governor of Cuba, and Don Diego Rodriguez Velázquez, royal Spanish portraitist) by expressing shock and disdain at the boorish behavior and loutish language of the soldiers with whom she bivouacked. She claims to have maintained her feminine gentility, even while masquerading as Lt. Buford, except of course when she-as-he flirted with women at official functions to give more credence to her deception. In short, Loreta Velázquez would have done anything to maintain Buford's macho image. 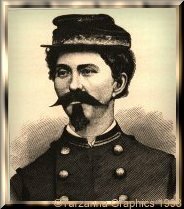 In her memoirs, she said, "All these months that, in a guise of a man, I had been breaking young ladies’ hearts by my fascinating figure and manner, my own woman’s heart had an object upon which its affections were bestowed, and I was engaged to be married to a truly noble officer of the Confederate army, who knew me, both as a man and as a woman, but who little suspected that Lieutenant Harry T. Buford, and his intended wife, were one and the same person." Velázquez said that she felt like a gambler playing for extraordinarily high stakes. She wrote "Fear was a word I did not know the meaning of, and as I noted the ashy faces, and trembling limbs of some of the men about me, I almost wished I could feel a little fear, if only for the sake of sympathizing with the poor devils." It was at the Battle of Shiloh in April 1862, that Buford was reunited with the battalion she had raised in Arkansas. "We had not been long engaged before the second lieutenant of the company fell. I immediately stepped into his place, and assumed the command of his men. This action was greeted by a hearty cheer from the entire company, all the veterans of which, knew me, [sic] and I took the greeting as an evidence that they were glad to see their original commander with them once more. This cheer from the men was an immense inspiration to me; and the knowledge that not my lover only, but the company which I had myself recruited and thousands of others of the brave boys of our Southern army were watching my actions approvingly, encouraged me to dare everything, and to shrink from nothing to render myself deserving of their praises." Having fought gallantly the first day, she decided that night to again gather intelligence. Hidden away in the brush she claimed to have spotted General Ulysses S. Grant and to have been close enough to shoot him, but decided against it. ‘It was too much like murder,’ she said. It was here at Shiloh that she was wounded by a shell while burying the dead after the battle, and an army doctor discovered her identity. Believing her military career was over because someone now knew her true identity, she gave up her uniform, bought a British passport from a friend, and began her second war career as a drug smuggler, blockade-runner, and double agent. 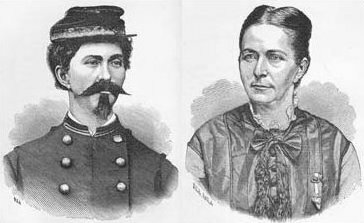 Historynet describes how her story ends: "She claimed to have been hired by the authorities in Richmond to serve in the secret service corps and began to travel freely throughout the North as well as the war torn South, pausing only long enough to marry her beloved, Captain Thomas DeCaulp. Widowed shortly after the wedding when her new husband died in a Chattanooga hospital, she traveled north, gained the confidence of Northern officials and was hired by them to search for herself." Can you imagine what a coup it was to be hired by the Yankee secret service to find "the woman . . . traveling and figuring as a Confederate agent"- Velázquez herself? "During her search she continued to serve the Southern cause by trying to organize a rebellion of Confederate prisoners held in Ohio and Indiana. She also claimed to have stolen electrotype impressions of Northern bond and note plates so that the Confederates could make forgeries. During the last months of the war she claimed to have traveled to Ohio, Canada, London, and Paris. She arrived back in New York City the day after Lee’s surrender. "She spent a number of months after the war traveling through Europe and the South. She also married for the third time. She and her new husband, a Major Wasson, left the United States as immigrants to Venezuela. But when her husband died in Caracas, she returned to America to convince her friends that immigration was a mistake. "Again she began to travel, this time through the West, stopping long enough in Salt Lake City to have a baby and meet Brigham Young. In Nevada she claimed to have married again for the fourth time to an unnamed gentleman. Then she was off again. ‘With my little baby boy in my arms, I started on a long journey through Colorado, New Mexico, and Texas, hoping, perhaps, but scarcely expecting, to find the opportunities which I had failed to find in Utah, Nevada and California.’" She certainly found them in Texas. Loreta Velázquez asked the public to buy her memoir so she could support her son with the earnings. She hoped her conduct would be judged with "impartiality and candor" and offered no apologies. "I did what I thought to be right, and, while anxious for the good opinion of all honorable and right thinking people, a consciousness of the purity of my motives will be an ample protection against the censure of those who may be disposed to be censorious." Today's policy of Don't Ask, Don't Tell would not have mattered back then, at least not for Loreta Velázquez, because a man’s gotta do what a man's gotta do, even if he's a she.